DownEast Acadia is an easily accessible region—by car, plane, bus, and ferry—that will offer endless surprises as you explore a wide range of places to visit. Many come to Acadia National Park, itself split into its more populated center on Mount Desert Island and its quieter reaches of the Schoodic Peninsula and several offshore islands. Mount Desert Island has its busy and quiet sides, too. Visit Bar Harbor for numerous eateries, excursions, and activities, but find your way to the out-of-the-way working fishing villages whose charm is rooted back generations. Heading elsewhere along the coast, you’ll find quaint villages, cozy lodgings, and artist communities in places like Deer Isle, Stonington, and Blue Hill. The towns of Bucksport and Ellsworth offer a delightful mix of enterprise, including one-of-a-kind shops and galleries, and historic theaters. 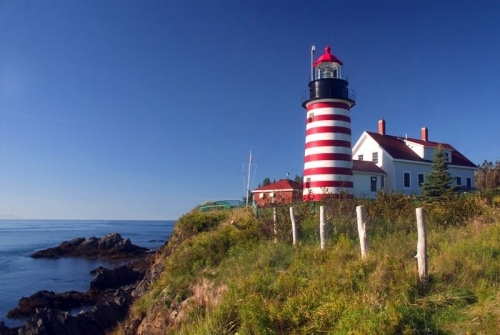 Follow the coastline further DownEast and you’ll find yourself amidst vast blueberry barrens and potato fields, dotted with small towns that offer a wealth of history, local shopping opportunities, food and arts festivals, and opportunities to get out on the water or enjoy scenic trails. When you reach the Canadian border, you might want to take advantage of the Two-Nation Vacation—cross-border activities that are often packaged as special deals.